Microcredit already existed in Asia several thousands of years before our times. In the 1970’s, Muhammad Yunus, Bangladeshi economist and laureate of the 2006 Peace Nobel Prize, gave its impulse to the development of modern microfinance. Microcredit is a low amount credit bearing interests granted to microentrepreneurs who do not have access to traditional banking services. Microfinance makes it its mission to break the cycle of poverty through an offer of both financial and social development tools aiming at the improvement of the recipients’ living conditions. Muhammad Yunus, gave its impulse to microcredit by creating the "Bank for the Poor" in Bangladesh (Grameen Bank). He proved that lending low amoounts of money can durably change the life of the poorest people. The impact of microcredit can be measured in terms of the increase in the recipients’ economic power and social inclusion and the reduction of their vulnerability to economic shocks, but beyond that, it should be understood as a prodigious tool in the service of empowerment. Microfinance is not charity. It consists in offering financial and non-financial services to populations that are excluded from the traditional banking system and give them the opportunity to participate in the global development process. Microfinance is not just about financial support and also provides the recipients with non-financial services such as training programmes, business advice, professionalization and consciousness raising workshops about diverse topics. On Babyloan, you can act in favor of a social microfinance by lending money to the person you want. The mechanism is easy: you choose a project in one of our countries of action, you make a loan from a minimum of € 10 and then you are repaid each mont from a part of the amount. Once you have been completely repaid, you can withdraw the money or lend again. Microcredit is a system developed by Muhammad Yunus. Microcredit is based on granting loans to microentrepreneurs who are excluded from traditional banking system. 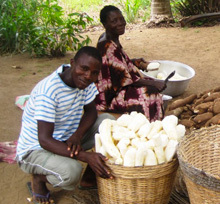 Microcredit gives them the possibility to develop an income-generating activity. Microcredit relies on empowerment concept. Microcredit is a powerful tool to fight against poverty. On Babyloan, we develop a philanthropic microcredit, based on philanthropic loan mechanism.